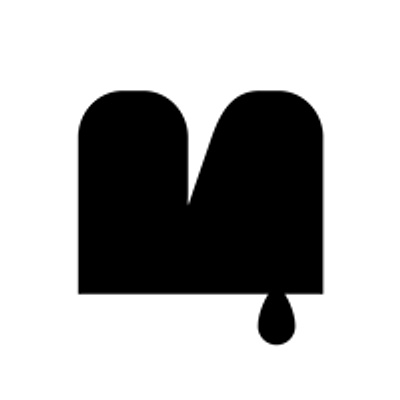 Mashrou’ Leila are a four piece indie band based in Beirut. Their rousing, sensual electro- pop anthems about political freedoms, LGBT rights, race, religion and modern Arabic identity have challenged the status quo of the Middle-Eastern pop industry. The loose collective of students who began jamming together in 2008 at the American University of Beirut has gradually focused into a an ambitious, fiercely articulate quartet: vocalist/lyricist Hamed Sinno, guitarist/multi- instrumentalist Firas Abou Fakher, violinist Haig Papazian, and drummer Carl Gerges. And the music they make has focused, too, into a charged, atmospheric version of pop that is geographically impossible to place. The lyrics draw on their collective experiences, which the band shares with the youth of the Middle East, and addresses the need for self-expression and a judgment free culture— a notion often stifled in a conservative society. Through their relevant and charged lyrics, their music has resonated with fans all over the globe, gaining international recognition for the band. 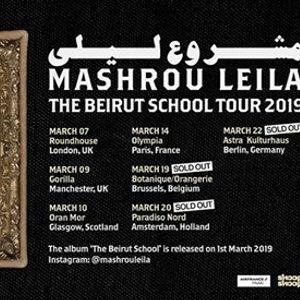 CNN has described Mashrou’ Leila as “The voice of their generation” while the Financial Times have called them “The Arab world’s most influential independent band”. 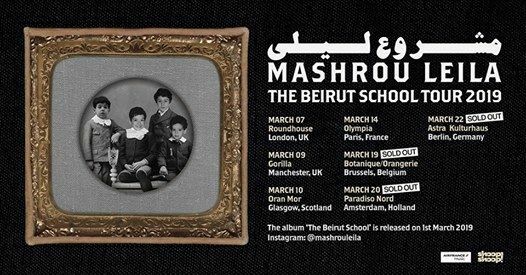 Mashrou’ Leila are currently working on their fifth studio album.